The heart of Cypress Creek Cultural District in Spring, Texas is located in Northwest Houston on Cypresswood Drive between Stuebner-Airline and North Greenfield. 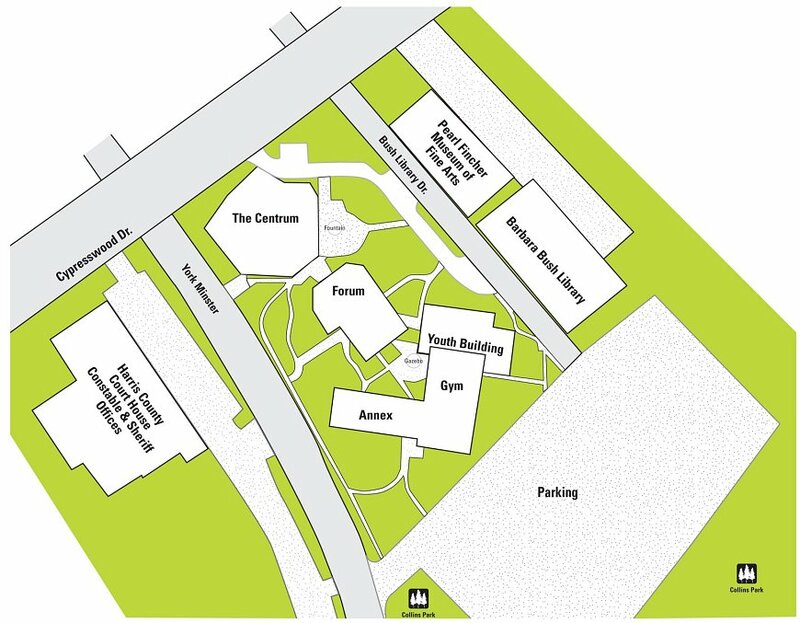 The entrance to the Cultural District on Barbara Bush Lane (shown as Bush Library Drive on Campus Map below) leads to a civic and cultural complex that is the heartbeat of the Cypress Creek Community. The District includes the Harris County Precinct 4 Courthouse, Cypress Creek Christian Church and Community Center – home of the Centrum and Cypress Creek FACE concerts — The Pearl Fincher Museum of Fine Arts, the Barbara Bush Harris County Library, and the Cypress Creek Greenway Hike and Bike Trails which are located at the south end of Collins Park. Nestled in the trees on the banks of Cypress Creek, it is the centering point for performing and visual arts, outdoor recreation, education, culture and a wide array of social services for the families of the Cypress Creek Community.